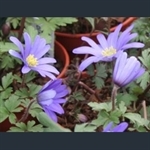 Woodland ground cover; range of blues, including pale blue. 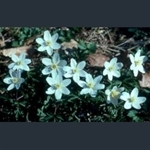 The wood anemone, with starry, pink-flushed white flowers. White flowers tipped with green, with a ruff of green bracts. Wood anemone form with pale sky blue flowers. Deep yellow flowers over attractive dissected foliage. 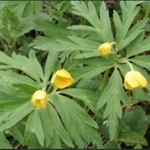 The 'aconite', yellow flowers with ruffs of green leaves in earliest spring. 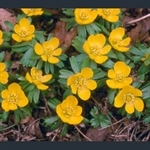 Yellow buttercup flowers; bronze-tinted dissected foliage.